When I first heard about the Polish judge Jan Sehn I wanted to get in contact with him. He had assisted the Germans in trying to find out what happened to those Polish people who were massacred by Stalin in the Katyn Forest and other places. The claim by some Communist Polish sources that judge Jan Sehn had died on the eve of the Frankfurt Auschwitz Show Trials are all wrong. In December 1965 the trials were over and Jan Sehn should have been back in Poland long before. Delving into the mystery of Jan Sehn’s death, I then discovered he died for some mystical reasons while still in West Germany which he was to leave to go back to Poland. Was Jan Sehn assassinated while in West Germany? If so, by whom? And if so, why was he considered so dangerous? Was one of the reasons for his death, his knowledge about Stalin and his Katyn Massacres and other War Crimes? At this time Zionism was deeply engaged with their Pension Fraud Crimes (PFC). Judge Jan Sehn must have known what was going on and that people were strenuously involved with fabricating fake pension claims. That would have been reason enough to kill him. 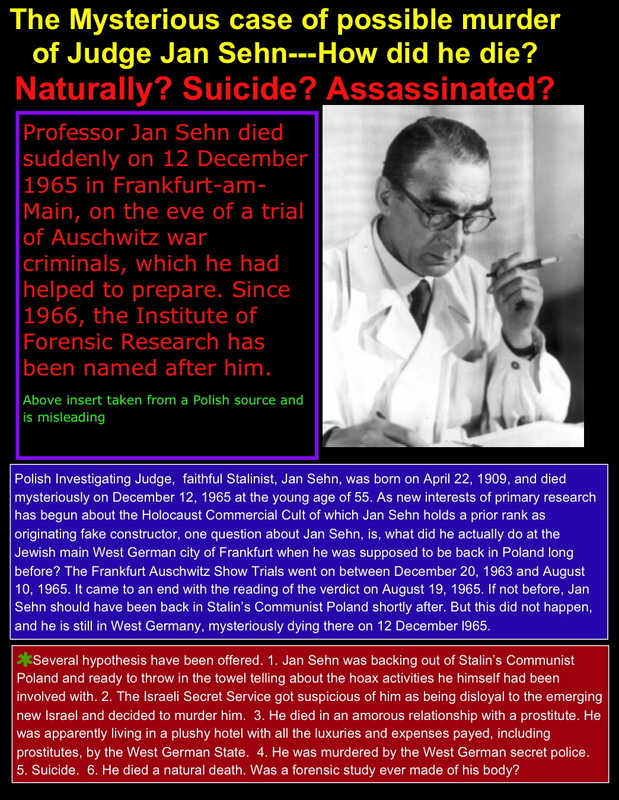 ditliebradio Was the Polish judge Jan Sehn murdered while in West Germany having assisted in the Frankfurt Auschwitz Show Trials?